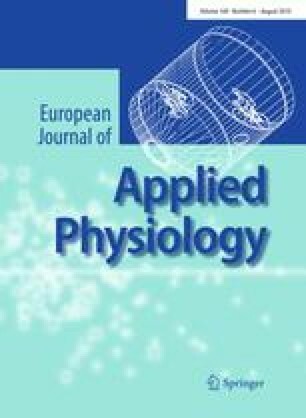 Inflammation associated with adipose tissue is modulated by macronutrient availability. For example, glucose increases inflammation in obese but not lean individuals. Little is known about how macronutrient intake influences inflammation associated with muscle. The aim of this study was to determine the impact of macronutrient intake differences during recovery from eccentric exercise on the inflammatory response. The study was a cross-over design in which young men and women (n = 12) completed high and low carbohydrate (CHO) conditions. Both conditions consisted of six sets of ten maximal high-force eccentric contractions of the elbow flexors and extensors followed by a controlled diet for the first 8 h post-exercise. Glucose, insulin, tumor necrosis factor-α, interleukin (IL)-1β, IL-6, and C-reactive protein were measured from blood samples pre-exercise, 1.5, 4, 8, and 24 h post-exercise. Perceived muscle soreness, strength loss, and serum CK activity were measured through 120 h post-exercise. Perceived soreness was elevated (P < 0.001) at all time points post-exercise in both conditions and was higher (P < 0.05) in the high compared to the low CHO condition. IL-1β increased (P = 0.05) 24 h post-exercise in the high compared to the low CHO condition. There was a trend (P = 0.06) for IL-6 to be elevated in the high compared to the low CHO condition. We conclude that inflammation induced by high-force eccentric exercise in skeletal muscle is greater when a high CHO compared to a low CHO diet is consumed during recovery. This study was funded by the Department of Health and Human Development at Montana State University and an ADVANCE Leadership grant from the National Science Foundation.